From Johannesburg, take the N1 South. 1Km before the Kroon Vaal toll plaza take the off ramp (Sasol – Parys). At the Stop turn Right and drive towards Parys for 15km. Just after the Parys airport (on the Left), turn right at Vaal Eden T Junction. On the Vaal Eden road drive for 200m and turn left at the junction. Drive for 5.5 Km. You will pass a Chicken farm, The Henning Klopper Stigting. 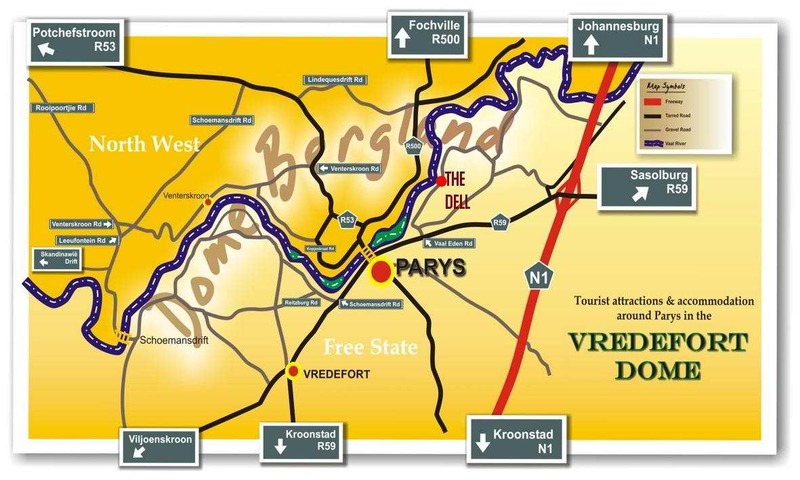 The Dell is Situated on the left side of the road, 6KM on the Vaal Eden road.